The 12c. 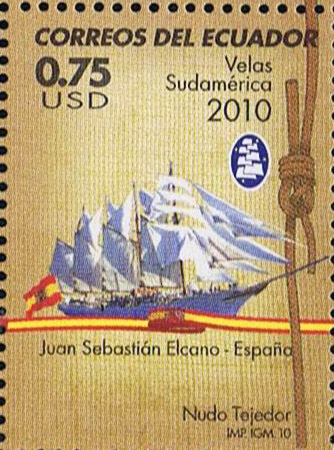 stamp depicts the Spanish topsail schooner Juan Sebastian de Elcano, previously shown on aspanish 10p. 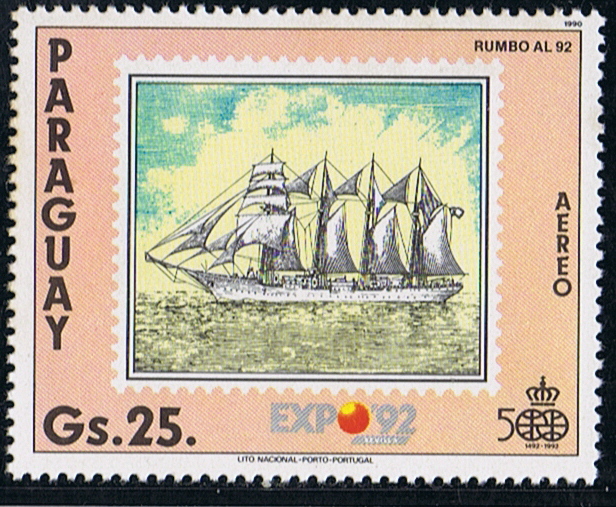 stamp of 1964. 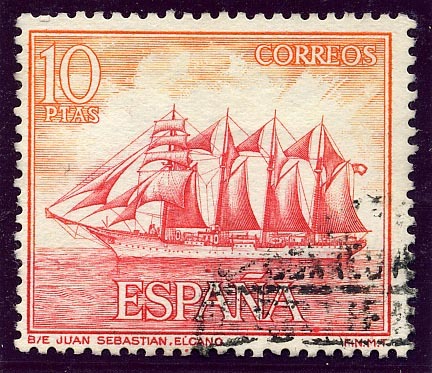 Built by Echevarrieta y Larrinaga at Cadiz, in March 1927, she has a displacement at 3/4-load of 3,420 tons. Overall length is 308 ft beam 43 ft.; full load draft 23 ft. She carries four 6-pdr. guns. Her single Sulzer oil engine develops 800 b.h.p. giving her a speed of 9 knots. She carries 230 tons of oil; and is a single-screw vessel, with a range of 10,000 miles at 9.5 knots. 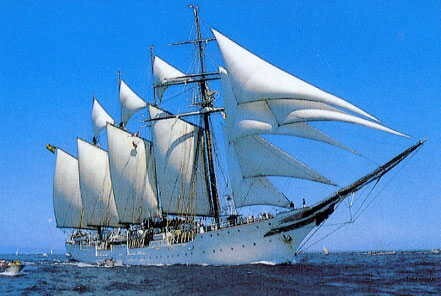 The ship's complement is 224, with 80 cadets. The vessel is named after the first circumnavigator of the world, 1519-1520. 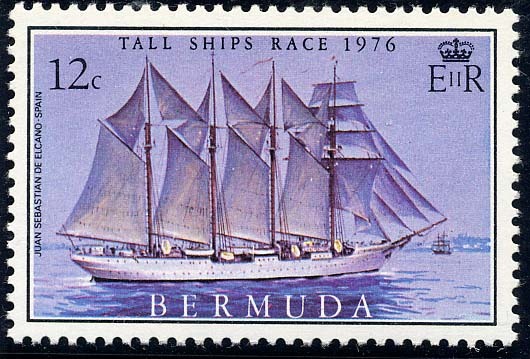 She was designed by Mr. C. E.Nicholson, of Camper and Nicholsons Ltd., Southampton. 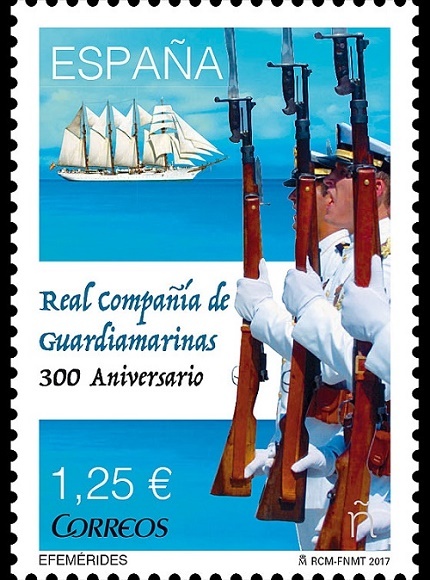 In 1717 the "Royal Company of Guardiamarinas" was created. It was in Cadiz where the first Academy was established and since then, despite numerous changes in its denomination and also in its location, it has been the institution where the officers of the Spanish Navy have received during these 300 years all the scientific, humanistic formation necessary to carry out their work in the army. Following the French and English examples, it based its training on theoretical and practical education. It was essential to know mathematics, cosmography, artillery and languages, but cadets also had to embark on one of the ships or frigates of the Navy to complete their training before receiving the title of officers. In its origins, only the sons of nobles and of the officers, could accede to this formation. There are several historical characters who passed through the Academy. 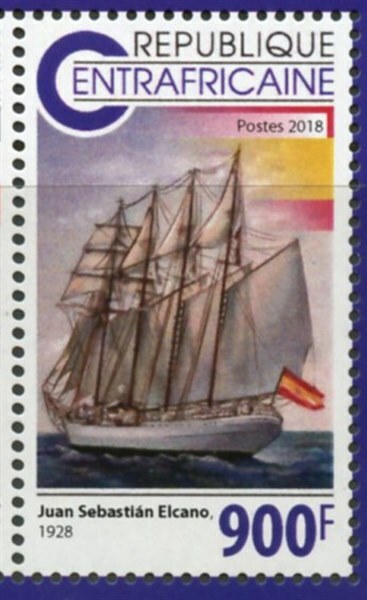 Jorge Juan or Antonio de Ulloa, whom Correos dedicated a stamp last year, are the best known. But there are many more. For example the Vicente of Tofiño, the author of the Devoyer of the coasts of Spain in the Mediterranean: and his correspondent of Africa, or the cartagenero Antonio de Escaño, member of the Council of Regency of Spain and Indias. In 1777 other academies of midshipmen would be opened in Ferrol and Cartagena, similar to the Andalusian. In this way formed the numerous officers who would swell the ranks of the growing Spanish Armada. Such was the success of the institution that not only the Spaniards had the honor to go through it. For example the Tsar Peter the Great of Russia, sent 22 officers to Cadiz to train them and thus to join the Navy of his country. 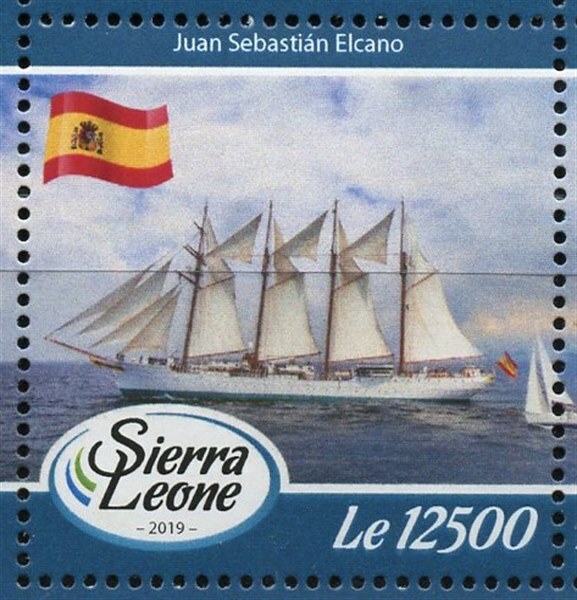 Also, young people from Cuba, Argentina, Peru, Colombia or Chile were educated, almost all children of Spaniards and natives of the place who wanted to dedicate their life to the Navy. 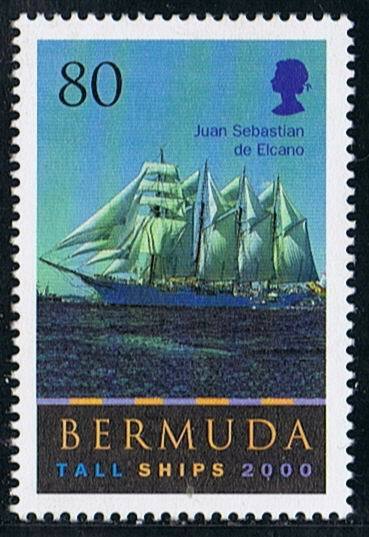 The stamp, with an intense blue background reminiscent of the sea, captures the profile image of Knights Guardiamarinas and the Ship JUAN SEBASTIAN ELCANO. Spain 2017 1.25 Euro sg?, scott? 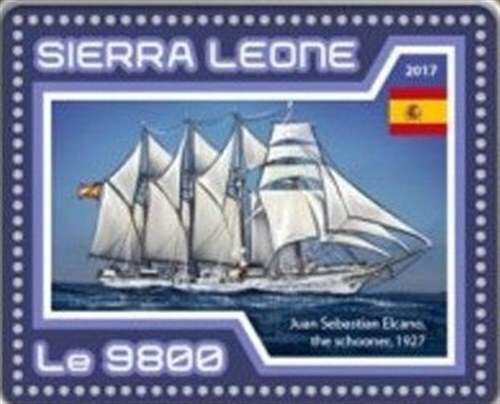 Sierra Leone 2017 9800 LE sg?, scott?